Capcom’s “Monster Hunter” series is quite the behemoth. 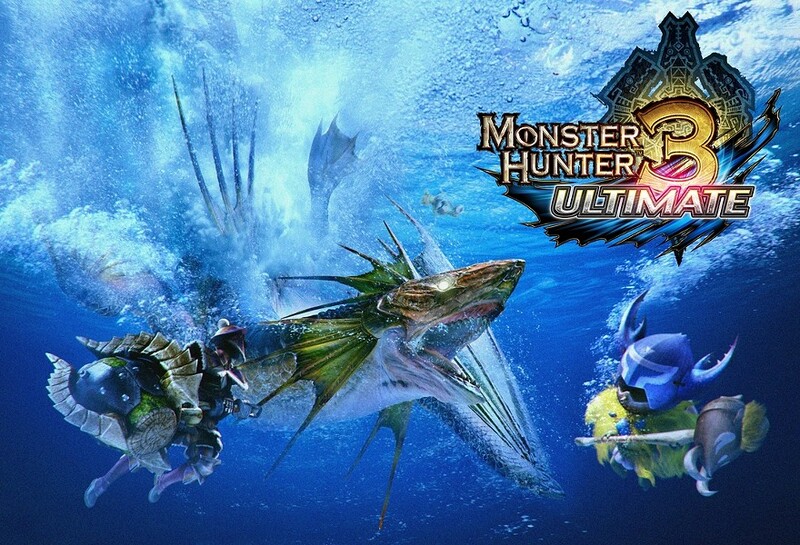 A hit series in Japan, but still somewhat under the radar in the West, “Monster Hunter 3 Ultimate” is an updated version of the 2010 Wii game “Monster Hunter Tri.” I tried getting into it then, but it never really clicked. Now, dual-released Wii U and 3DS titles have grabbed me back, sucking me into one of the minutest detail orientated game I’ve ever played. My first weekend with the game, and it seems I’ve finally caught the “Monster Hunter” bug. Will you? There are a few pieces of advice you need to know before jumping into “Monster Hunter 3 Ultimate.” It’s a slow burning game. It's tough as nails, and will unforgivably remind you how inadequate you are at life. Playing alone (especially online) is pretty much suicide, and finding someone to show you the ropes could make or break the experience. It’s odd to call a game about hunting giant monsters realistic, but the game just feels that way. You start off as a brand new hunter, appearing in a monster-ravaged village that needs your help to slay giant beasts. Sounds simple enough, right? Unlike other RPGs, there is no real character leveling. The monsters don’t have health bars. All your growth is done through armor and weapons, which you buy and forge from monster remains you collect. Kill harder monsters, get better gear. Rinse and repeat. Don’t forget you’ll need healing items (which you also need to harvest and make), and pay attention to your stamina bar (you didn’t expect to be able to run forever did you? ), and then there’s traps, and multiple weapon classes, and expanding your farm and learning to fish and making sure you have whetstones to sharpen your blade, and it goes on and on. It’s overwhelming, but also seemingly never ending. But then, hours of your life will start to melt away, and you won’t know why. Oh, you needed this one perfect random drop from killing a monster to complete your armor set. This monster keeps killing you and you start taking it personally. Or you just spend time running around the wide open - and quite good looking - world, listening to the beautiful music and collecting herbs and mushrooms to make potions. Roar. Probably don't want to be on the wrong end of this guy. When I first jumped into the game this weekend, I grabbed someone to go online with, and to our discredit, we skipped the first few solo missions (the ones that, you know, teach you to do things) and spent a giant amount of time trying to figure out how to play online. Did we need to go to the Tavern? Or the Marina? (You need to go to Network Mode…). We ran around like a bunch of chickens with our heads cut off before some kind soul joined our party and guided us. Four days later, we were taking down a Qurupeco by ourselves (take THAT damn bird). In those first few lonely hours though, the game seemed boring and daunting, and I was close to tossing in the towel. But having someone help you take down some of the larger foes and give you a few pointers can really be the difference between clicking with the game, or giving it up and having a life. Your call which is more important. The game’s online experience has been great, and should stand as a benchmark for future Wii U online titles. Four players all running and slaying monsters has been practically flawless, and the game also boasts online voice chat either through the GamePad itself or through headphones. Online voice chat on a Nintendo console? About time. It isn’t perfect quality (though headsets are supposed to improve that), but just it being there is something. Take note Nintendo and other third party developers, take note. From what I’ve played, the Wii U and 3DS versions as nearly identical (save for the lower resolution graphics and lack of online battling on the portable), but you can transfer your saves between the two systems, taking the hunt on the go. The 3DS version can also go online in multiplayer when connecting through a Wii U, for cross-system LAN parties. Again, Capcom is leading the fray in terms of 3DS and Wii U connectivity, beating Nintendo to the punch on its own console. The only missing feature on the 3DS is the beating-a-dead-horse second analog stick, so the game gives you a virtual control stick on the screen. It’s not an ideal option, but until the Circle Pad Pro XL ("Monster Hunter" was pretty much why Nintendo created that) is released stateside, it’s the best we have. But with two versions, the hunting really never, ever, has to end. Which is dangerous. If that wasn’t bad enough, Capcom is also adding off-TV play for the Wii U version in an update, meaning that no matter what you are doing, you could also be hunting monsters. The game isn’t perfect, but I’m still far from complete enough to pass final judgement. The game’s text, even on my giant HD TV, is headache-inducingly small, item management could be much better implemented on the touch screen, the game letterboxes the touch screen (probably remnants of the game being upscaled from the 3DS version), and many people will probably find the difficulty too difficult to even know where to begin. There's a lot of new inclusions over the Wii version, but I can't say if people who played the original will have the same sense of discovery I'm having. Willie Clark used to have some semblance of a social life. He doesn’t think he will have one anymore. If you want to ask him about "Monster Hunter," play "Monster Hunter" with him, or know a "Monster Hunter" therapy group, let him know on Twitter or Facebook.